This month marks three years on the road for us. It feels like it was only yesterday that we started this journey, yet we can hardly remember our lives before. We’ve had many ups and few downs living an in RV, but we’re quite content with our lives. Part of this may come from the transformation we’ve experienced since we’ve been traveling full-time. When you live in an RV, you adopt a mantra: one in, one out. There just isn’t the room to collect things. We started paring down our collection of stuff in preparation for living in an RV, but once you’re in it, the lack of extra storage space really helps to curtail any retail therapy you may employ. The fact that we no longer watch much TV and even fewer commercials means we’re not as bombarded by messaging to buy, buy, buy and have less impulse to go shopping. We now collect memories and sunsets with a few smashed pennies and stickers thrown in for good measure. Additionally, we enjoy slowing down, sitting around campfires with friends, hiking, exploring in our off-road capable toad, and generally just hanging out. We aren’t out to see everything possible and spend every dime we have to get into theme parks and such. We take pleasure in what’s around us and the company we keep. While neither of us were ever crazy planners, Kerensa did like to have a general plan of where we were going and what was around when we got there. Sometimes that skill still comes in handy like planning for the Florida Keys, but for the most part, we don’t make reservations anymore. We prefer to stay loose with our plans and be able to adjust quickly to meet friends, dodge weather, or choose a destination on a whim! Our lives have become more laid back and we have become more laid back with them. Going to Mexico for a dental check-up was not something Brandon would have entertained three years ago. Now, it’s just part of the RVer life. When things break, we don’t stress too much. We just make a plan to fix it, adjust, and move on. We both identify as introverts and only keep a few close friends. But living in an RV has made us more social than ever. We are usually up for any kind of RVer meet-up and we’ve made so many friends this way. Connections are made quick, but deep. Never before have we felt such a strong sense of community while living in a fixed location. We keep up with our friends digitally when not together, but we will go out of our way to meet-up when possible. We plan gatherings in the winter and try to attend Xscapers convergences when we’ll be in the area. We have more friends in our circle now than all our years before! We wrote more about how we stay in touch in Staying Social on the Road. There are many reasons we love our life on the road. 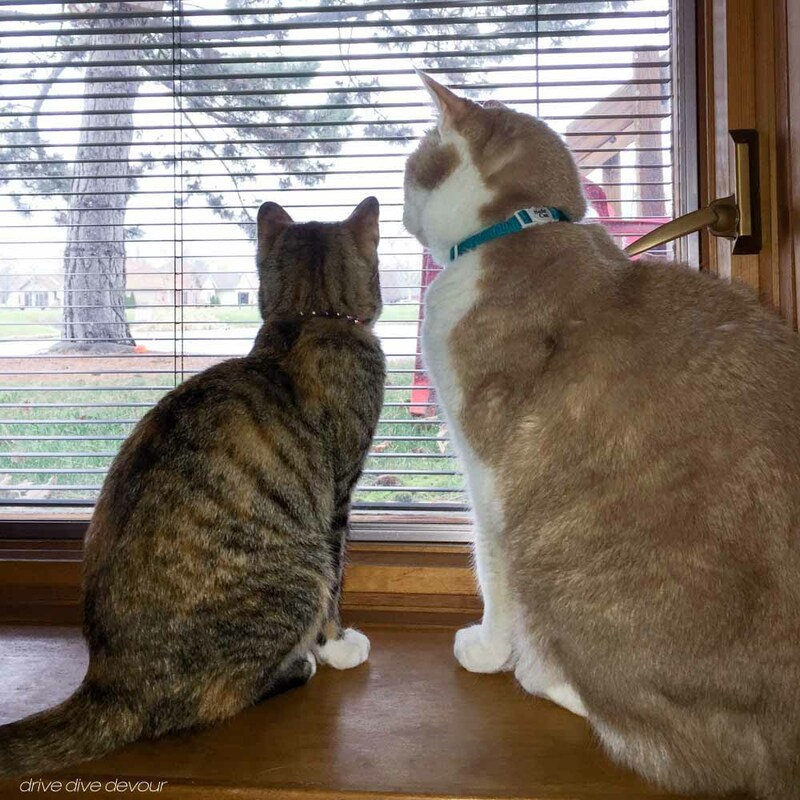 The top one is being able to travel, of course, but the RV life has afforded us other opportunities we didn’t think about when we took off three years ago. Instead of taking a few days off of work and flying out to see family twice a year, we can now park nearby and visit like we’re neighbors. This also applies to friends scattered throughout the country. When you have limited time to travel, you may only get to see some friends every few years if at all. Now we’re working on making a second loop to visit everyone again! Again, we’re not stuck to a vacation timeline. We are not on vacation, this is our life. So instead of pulling in for a week and cramming our days full of sightseeing, we balance our days with work and play. We choose what we would like to see, but don’t feel compelled to “get our money’s worth.” We may stay a few days or a few weeks depending on what we want to explore in the area. During this time, we’re carrying on a normal life similar to a resident by shopping at local stores, eating at local restaurants, and participating in daily life. I cannot say we are true citizens by any stretch, but it does give us a better sense of place than a vacation usually does. We didn’t start doing this one right away, but, boy we were happy when we did! It really opened up the possibilities for us and made us love this life even more. Upgrading our batteries and adding solar upped our game and allowed us to get off the grid even if it’s just at a Harvest Host or casino. But being able to camp amongst the red rocks of Sedona is something special, especially when it’s just you or a small group of friends. It’s a good breather between campgrounds and something we try to do as much as possible. And can you really beat the low, low price of free? We actually have a hard time with naming the worst things. That’s not to say everything is perfect and all rosy in RV living, it isn’t. It’s just that nothing seems so awful that it needs to be called out. Maybe it’s our more laid back attitude or just knowing things like dumping the black tanks are just part of life, but it never seems that bad. Still, we feel compelled to come up with something, so here are our least favorite things about living in an RV. This is mainly because it is our home and office and it can be disruptive. If we need to be out of the RV while work is being performed, we have to find somewhere else to work or wait with our pets. We’ve done this at the service center, at a friend’s house, and once we just rented a hotel room because we didn’t want to work in the car all day with two dogs and two cats. We don’t think they wanted to sit in the car all day either. We’ve also spent the night at service centers which are not the most scenic locations, but really aren’t all that bad. Sometimes you even get to plug into power. There are some things we do ourselves, but it’s not like we carry a full mechanic’s tool set for everything that comes up. Installing our sway bars in the desert sounded like a good idea, but after a couple missing and broken parts were uncovered on the RV, we had to put it all back together and go to a shop. We were city dwellers before heading out on this never-ending trip. We drove daily to work in big cities like Dallas and the area around New York City (for her part, Kerensa will readily admit she took public transportation daily in NYC and was already out of practice). 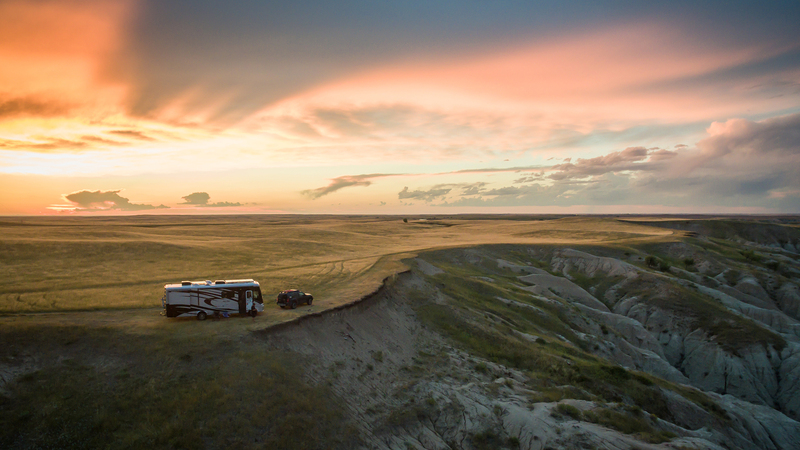 Doing it in a car is one thing, but in a motorhome is an altogether different experience. Cars tend to zip around you and most people don’t realize how long it takes for an RV to stop. It can be a little nervewracking. To combat this, we try to avoid rush hour and may take alternate routes. PSA: Don’t cut off an RV in traffic. You may think you’re jumping ahead, but you may be dooming yourself to being rear-ended by something 5 times your size. This is a little bit of a whiny thing to say, but it’s real. Holiday weekends tend to just blend into the calendar now and it’s easy to forget to plan ahead. We’ve been lucky so far and already had holidays booked totally by accident, found boondocking, and spent Independence Day parked in a dive buddy’s driveway, but we have forgotten holidays and so have our friends. Memorial Day weekend campground reservations may be booked months in advance and we just don’t think like that anymore. Maybe now is the time to set reminders. There are so many things that we’ve loved that it’s hard to choose, but there are a few stand-outs. Last winter, we spent the week leading up to the new year with around 40 other rigs in the Anza-Borrego desert. It was truly one of the most memorable New Year’s Eve nights we’ve ever experienced. We sang karaoke (well, not us, we watched karaoke), burned a plywood borrego, and ate like kings at a potluck out in the middle of nowhere. It was pretty fantastic. From there, we broke off with a smaller group in search of better internet and continued with the community happy hours. We then hiked it up to Quartzsite for an Xscapers convergence and another gathering of close friends. It was a pretty great way to spend a month, especially before we all dispersed in different directions for the spring. 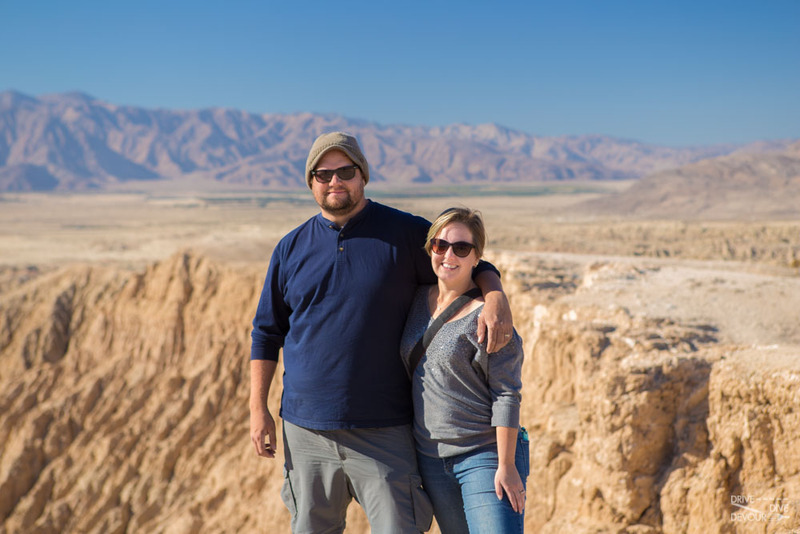 We already discussed becoming more social, but meeting other full-time RVers in this community is one of the best things that has happened to us. There are some people we consider friends that we haven’t even met in person yet. 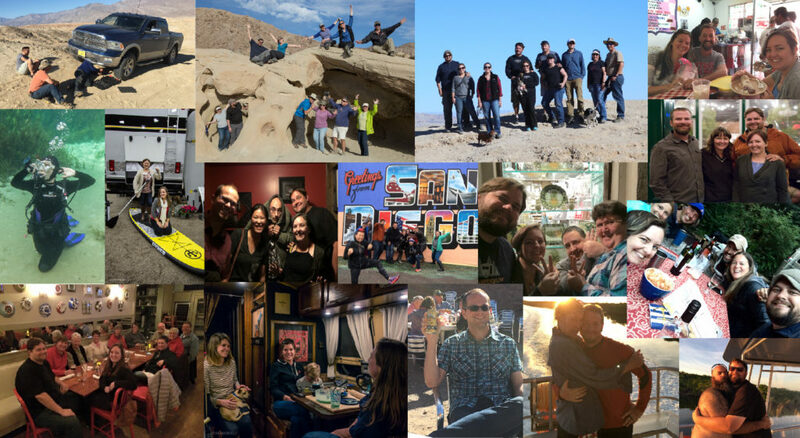 The RVing community is welcoming and open and we often start friendships online through Facebook groups or Instagram before crossing paths in real life. 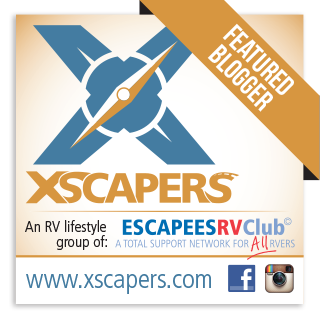 And beyond RVers, we have met many interesting people living all over this nation. We’ve watched artisans work their magic in New Orleans and listened to teachers in small towns describe what it’s like teaching in a school of fewer than 10 students. Traveling has shown us different perspectives. Moving around the country, we realize that people are more alike than different. They all have their individual struggles and are just trying to get by the best way they can. What brings us together is a sense of community and we love to help foster that. We already knew we enjoyed Vermont having traveled up to the southern part of the state a few times when living in the area. But we were still surprised by how much we enjoyed Burlington once we got up there. We only had a few weeks, but could have easily spent the whole summer there. It really seems to come alive and Vermonters make the most out of the season. Brandon was able to dive Lake Champlain multiple times and explore a wreck only a handful of people had seen before. And seriously, we’re out of maple syrup, so we may need to go back this year. When we say new, it’s only new to us, but that’s how we prefer it. Let someone else shake it down. After hemming and hawing over trading in our previous RV, we finally decided to go for it. We knew our old one was too big for us and we didn’t want to invest in upgrades like solar when we didn’t feel like it was ours. It was the right choice and we’re very happy with our current set-up. We installed solar panels, so we didn’t have to worry about the batteries overnight or running the generator twice a day like on our old coach. We have more options as to where to stay with our smaller size and off-grid capabilities and that makes us very happy. Now we just need to redo the interior a bit and it will be all ours. Living in an RV doesn’t magically make the world stop and we’ve had our share of heartache and frustration over three years, a lot of it personal. Kerensa lost two grandparents within a year and when you’re on the road, it can be hard to get home. And sometimes things just go wrong. Yes, we’d say having our car catch on fire in west Texas definitely ranks as a low point. 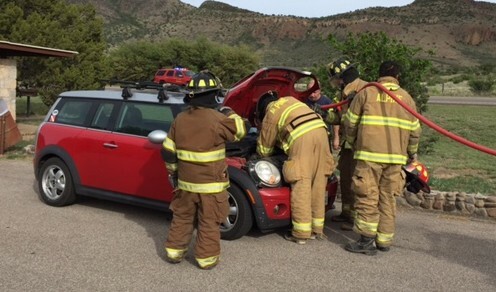 We had stopped at a pull off area in between the small town of Alpine and the smaller town of Marfa looking at wildflowers when Brandon noticed the car smoking. Brandon ran back and found a fire in the engine compartment. We pulled our small fire extinguisher out of the trunk and knocked the flames down. Brandon was able to pull everything out of the car while Kerensa called for help. The signal is very spotty out there and we were able to maintain signal just long enough to get our location to the operator. When she asked for a call back number in case we were disconnected, the line died and the signal never recovered. Thankfully, the sheriff and fire department were already on their way and they were able to put out the fire and take us back to the campground. We scrapped our plans as our car was towed off to be repaired in El Paso and we had to move to a bigger city to find a rental. It turns out that Minis have an issue that can cause them to catch on fire at any time. Not trusting it after that, we switched it out for the Xterra. It was a pain at the time, but now it’s a story to tell around the campfire. 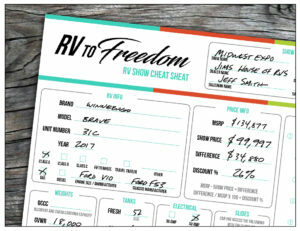 We are opening a Facebook group called RV to Freedom: Learning to Live in an RV where anyone can come and ask questions to learn about living in an RV. We truly hope to help people get over their fears, cut through the clutter of opinions and information on the internet, and learn how to live on the road. We hope you’ll join us and share your experiences, too. The full-time RV community is welcoming and open and we want to encourage everyone to join, participate, and form connections. It makes us better prepared and better people. We hope to see you there and on the road! Share our post or tell your friends to join by going to RVtoFreedomGroup.com. We can’t wait to chat! Join the RV to Freedom Facebook Group! I saw your post on my Facebook newsfeed this morning. I havn’t decided whether to join or not but I am thinking about it. I am in the research phase of looking at life on the road. We hope you join as that’s exactly why we created the group, so people have a place to go when researching life on the road and learn from others already doing it. No matter what you decide, good luck on your journey. There are many choices ahead of you and lots of opportunities. You may also want to dig around on our site more, especially in the “Life on the Road” category. There should be some articles of interest there. We will be posting a lot more info about getting started, too. Really good post! We look forward to following you and comparing our experiences with yours. We have been full timing for 22+ years and, like you, have NO intentions on stopping! When we started in 1994 I’m not sure the term “fulltime RVers” even existed. We had been campers with our kids and decided we wanted to roam our country for maybe six months or a year or so! Twenty-two years is impressive! We look forward to hearing about your experiences and all your stories, I’m sure you have a ton. See you on the road! Congrats on the anniversary! We saw your Drive Dive Devour sticker on your Xterra when we were at Long Key. Didn’t think to look it up until we left. Bummer! We should have stopped by and said hi. 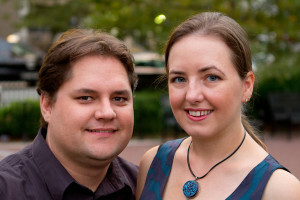 We just started our travels 6 months ago – so it would have been nice to chat. Reading this article of your thoughts/experiences is probably the next best thing! Where’s next for you guys? We’re headed up the east coast of Florida over the next few weeks. Oh, it’s too bad that we didn’t get to talk! We did see your Lance down there. We’re in the Keys for a few more weeks and then we’ll be heading north to help out family with a move. Hopefully, we’ll see you on the road sometime. I will be 85 in June. Will be full time as soon as I sell my 4000 sq ft home. Just bought 26 ft class C. Husband died 7 yrs ago so after 62 yrs married…I missed all the trips he and I had in big class C,s with several children and grandchildren…I want to revisit all the places we enjoyed so much. I mostly boondock at Wal Mart. Nice meeting you. Enjoy your adventures and we hope it brings back some good memories!